Since 1994, Molecular Biotechnology: Principles and Applications of Recombinant DNA has introduced students to the fast-changing world of molecular biotechnology. With each revision, the authors have extensively updated the book to keep pace with the many new techniques in gene isolation and amplification, nucleic acid synthesis and sequencing, gene editing, and their applications to biotechnology. 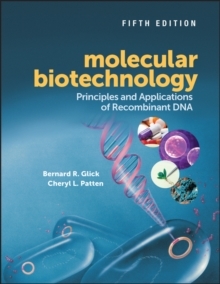 In this edition, authors Bernard R. Glick and Cheryl L. Patten have continued that tradition, but have also overhauled the book's organization toDetail fundamental molecular biology methods and recombinant protein engineering techniques, which provides students with a solid scientific basis for the rest of the book. Present the processes of molecular biotechnology and its successes in medicine, bioremediation, raw material production, biofuels, and agriculture. Examine the intersection of molecular biotechnology and society, including regulation, patents, and controversies around genetically modified products. Filled with engaging figures that strongly support the explanations in the text, Molecular Biotechnology: Principles and Applications of Recombinant DNA presents difficult scientific concepts and technically challenging methods in clear, crisp prose. This excellent textbook is ideal for undergraduate and graduate courses in introductory biotechnology, as well as, courses dedicated to medical, agricultural, environmental, and industrial biotechnology applications.